Your bass and your audience will love the tight, punchy sound of this 3x10" cab. 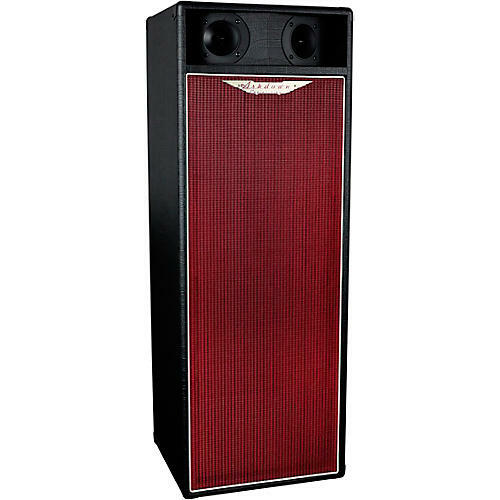 Ashdown have launched a 3x10" dual-horn bass specific speaker column inspired by PA systems of old the CL-310-DH uses three 10” custom Ashdown drivers as well as a set of high frequency horns to deliver loud, focussed and gut-rumbling cabinet. Ashdown were recently asked to build something new for their good friend Guy Pratt who has recently taken on a new role as the bass playing front man for Nick Mason's Saucerful of Secrets band which features some incredible musicians. So Ashdown set about designing something completely different to be used as a pair on Guy's new tour with the band. The cabs were so striking and sounded incredible, they simply had to put them into production. The cabs are rear ported with a 6” tuned port, they feature a tilt-back design with casters on the rear of the cab plus a conveniently placed handle on the top so you can just tilt back and wheel away. The cab also has another side recessed leather handle to carry on its side. The cabs feature a red custom weave grille with old English white piping, finished in a heavy bronco tolex adorned with the Ashdown double-wing logo.